Harry Brown wrote: The only way you can know CAP 413 is by reading it! This is true, especially when it comes to the RT practical exam where you will be expected to use standard phraseology where it exists as HB states above. If you don’t have CAP413 google it and download it - it has loads of examples. Cap 413 Chapter 4 Figure 2 (p98 in pdf) says "Report DEADSIDE DESCENDING". as you say, read CAP 413. And call signs should only be shortened when ATC say so. I have no idea where you got "STUDENT-CD" from - that is wrong. Also, as this is the student forum, I suggest this isn't the place to debate the merits of the standard OHJ. Thank you for your response. First of all you say you have no idea where I got “Student CD” from. As a PPL Examiner, FIC instructor and RT Examiner allow me to explain. The use of the prefix “Student” is well documented in CAP 413, the UK AIP GEN 1.7 AMDT 12/2018 and both the Pooley & AFE Training Manuals. The Student prefix was introduced in the 80s and was originally based on the RAF prefix “TYRO”. On initial contact, student pilots who are flying solo shall use the callsign prefix ‘STUDENT’. Once acknowledged, it will not normally be necessary for student pilots to use the prefix in subsequent transmissions until making initial contact with other ATSUs, unless they feel they are being instructed to do something with which they are unfamiliar. Controllers will acknowledge the initial call, again using the prefix, and can be expected, in so far as is practicable, to make due allowance for the limited experience and ability of student pilots in determining the pace and complexity of instructions and/or information which are subsequently passed. 2.35 Flight Instructors must brief students, specifically, on the use of this callsign prefix as part of their pre-solo briefing. The use of this callsign prefix is not intended to remove the additional requirement for flight instructors to notify ATSUs separately of ‘first solo’ flights where this is normal practice. So now you know where I got STUDENT G- ABCD from (hopefully) Ensure you understand the legal definition of MUST too because you should have been taught this during your training unless you were pre TYRO!. When, after ATC has first of all abbreviated the full callsign, you may in turn abbreviate your full callsign, as you correctly pointed out and you can be sure that I know that because I've been teaching it for the last 40 years! My point was, which I think you missed, is when you abbreviate it, it shouldn't be abbreviated to STUDENT G-CD, it abbreviates to STUDENT - CD. 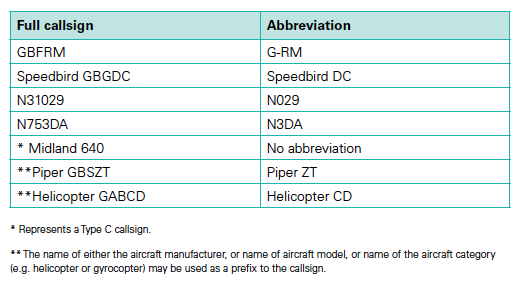 CALLSIGNS for AIRCRAFT 2.26 table 10 shows why. See the SPEEDBIRD example and this should explain. many airfields do not have standard overhead joins anymore. For instance at one airfield if you descend to 1000 ft on the dead side you may well hit a glider coming the other way or at another you may just clear a helicopter by 250 feet coming the other way. I say clear but if your 125 feet low and he is 125 feet high the only thing that is going to be clear is the collision! “When runway and circuit direction are ascertained begin letting down on the dead side. If required, report DEAD SIDE DESCENDING” You forgot to mention “IF REQUIRED”! If you also look in the AFE training manual, you will not find STANDARD OVERHEAD JOIN in the index but you will find Overhead Join. It's also worth looking at The Gloucester VFR Guide as they are reputedly the busiest GA airfield in tbe country, not a shining example of CAP 413 Phraselogy but useful to consider because they may ask you to report in two other positions after the overhead! Descending or Crosswind! Confused? Think how students, whom you don't want to know any of this, feel. The above actually highlights yet another reason of why UK GA training can be very non standard! Yes - of course I know about the student prefix to a callsign. But ATC never asked me to continue to use "student" after initial call. Student GABCD has always been shortened to G-CD. I have continuted to use it in an non-atc field which was busy to warn others. If the pilot reported as "Fastjet Speedbird GABCD" then it would still be abbreviated to Speedbird CD, as Fastjet is another allowed prefix. Another prefix can be "Mayday". You don't change from G-ABCD, to your initial abbreviation (by ATC) of G-CD to Mayday-CD. The only example of a prefix being used as the call sign, rather than just as a prefix, is when it is used as a type ("helicopter CD"). CAP 413 clearly describes the places to report for a standard overhead join, in a mirror diagram and wording to how it describes where to report in a normal circuit. Do you also say that it doesn't officially say where to report in a normal circuit? The "as required" is because ATC may tell you where to report. If you aren't at an ATC field and are performing a standard overhead join, you need to report deadside descending. The standard OHJ poster that is commonly used doesn't include any reporting points. Skyway Code is too big to open on my phone. You have to follow local patterns of course. Near me, Standard OHJ is fine at pretty much every landing place. Many places elsewhere have noise abatement circuits. You need to learn, as a student, what the standard is, then to adapt that to the place where you are flying. You teach / learn thr standard, then expand that to the specifics of where you are landing. riverrock wrote: Yes - of course I know about the student prefix to a callsign. But you dont! ATC will never ask you to continue to use the student prefix. Its at the prerogative of the student whether he/she wants to use the prefix after the initial call, it clearly says that in CAP 413. In which case, as a pilot can never initiate abbreviation of a call sign, STUDENT-CD will never be used. Which was my original point. I'm with @riverrock - ATC will always respond to a student's initial call with either "Student G-ABCD" or "Student G-CD". The student may then continue with "Student G-CD" or simply with "G-CD". No-one should ever use "Student-CD". With respect can I say as someone who regularly used the Speedbird prefix your talking complete nonsense where an earth did you get that from? A pilot wouldnt use 'FASTJET SPEEDBIRD' anyway because they are two different prefixes, one is airforce and one is civil! You dont abbreviate a MAYDAY call because the ATSU dealing with a Mayday call will never abbreviate it, at least they are not supposed too, They always use your full callsign when replying so you should use your full callsign in your reply but thats got nothing to do with the above. you only need one prefix in front of an abbreviated two letter callsign. It says this about the student prefix which might be classed as a special prefix as opposed to the "normal ones in the pic above. instructed to do something with which they are unfamiliar. This is a student forum and as such should be a learning environment. It's not a wi11y waving competition. T67M wrote: I'm with @riverrock - ATC will always respond to a student's initial call with either "Student G-ABCD" or "Student G-CD". The student may then continue with "Student G-CD" or simply with "G-CD". No-one should ever use "Student-CD". Using your logic the abbreviation would be SPEEDBIRD G-DC , it isn't! You must have a diferent version of CAP413 then because even the table, which I quoted and youve inserted shows clearly they are prefixes! Harry Brown wrote: You must have a diferent version of CAP413 then because even the table, which I quoted and youve inserted shows clearly they are prefixes! Maybe there are 2 versions on the CAA website or perhaps the doc contradicts itself in different sections. Its those sort of crass comments that preclude learning, if you cant be a professional at least try and act like one. If you started an airline called 'Student Air' and your callsign was "Student" and your aircraft was GABCD, using tbe CAP413 Spedbird example I gave you what would your abbreviated callsign be for STUDENT G-ABCD? Ive nothing more to add to this discussion. Lochavaon, ive blocked you so I cant see any of your posts-and Golf Hotel! Last edited by Harry Brown on Sat Feb 09, 2019 6:54 pm, edited 1 time in total.